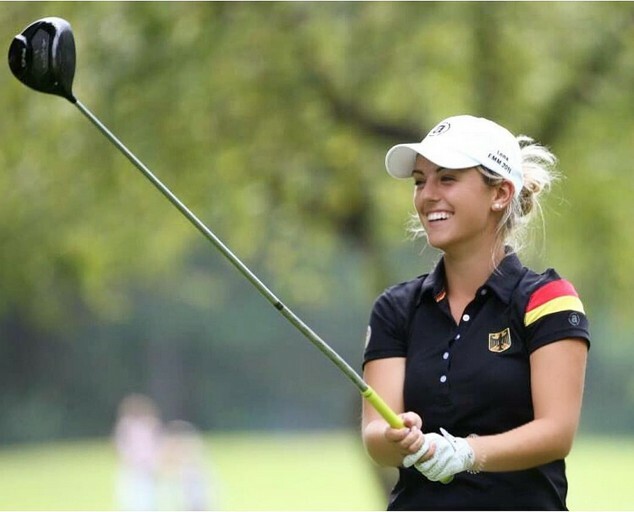 Alas, Schaeffner's most recent tournament included some disappointment: She had to withdraw from the International European Ladies' Amateur Championship in Austria this week due to a knee issue. But Lena does have plenty to be happy about these days: She's a member of the German National Team (which, the way, is absolutely stacked with both golf talent and golf babes), ranked in the Top 50 in the world in the latest amateur rankings; and earlier this year became the first golfer ever from Coastal Carolina University to make it into the NCAA Women's Championship tournament as an individual. Lena is from Rettigheim, Germany, and helped her high school there win the German national championship before heading to South Carolina to play collegiately at Coastal Carolina. And she made an immediate impact for the Chanticleers, playing every tournament as a freshman. In her first two seasons at CCU Schaeffner came close multiple times to her first college win - she had three runner-up finishes. NCAA Win No. 1 came for Lena this past season, her junior season, at the Palmetto Intercollegiate in October of last year. She won again in March of this year at the 3M Jaguar Intercollegiate. She had five Top 5 finishes during the regular season. Then she won the Big South Championship tournament, finished second at the NCAA Regional and advanced into the NCAA championship. That's having a great season! That kind of success made me wonder one thing: Would she enter Q-School next month or return for her senior season? CCU alums will be happy to know that Lena is coming back for the 2015-16 season. Lena told us that she wants "to be successful one more year on college level before I turn pro next summer. Also it is very important for me to have a degree even though I might not wanna use it in the near future." After that? Q-School beckons next year, with Lena likely to enter both the LPGA and LET qualifying tournaments. "I want to start playing some tournaments on the Symetra Tour as soon as I graduate to stay in the flow of playing," Schaeffner said. "I'll play both Q-schools trying to get one or both tour cards. But as of right now I think I'll definitely want to stay in the US trying to make my way on tour here. I had a really good season this year and I think I can be successful on the LPGA in a couple of years."